SINGAPORE, June 3, 2016 - (ACN Newswire) - Every day, we are exposed to millions of harmful bacteria that can cause infectious diseases, such as the E. coli bacteria. Now, researchers at the Institute of Bioengineering and Nanotechnology (IBN) of A*STAR have developed a new material that can kill the E. coli bacteria within 30 seconds. This finding has been published in the peer-reviewed journal, Small. "The global threat of drug-resistant bacteria has given rise to the urgent need for new materials that can kill and prevent the growth of harmful bacteria. Our new antimicrobial material could be used in consumer and personal care products to support good personal hygiene practices and prevent the spread of infectious diseases," said IBN Executive Director, Professor Jackie Y. Ying. Triclosan, a common ingredient found in many products such as toothpastes, soaps and detergents to reduce or prevent bacterial infections, has been linked to making bacteria resistant to antibiotics and adverse health effects. The European Union has restricted the use of triclosan in cosmetics, and the U.S. Food and Drug Administration is conducting an on-going review of this ingredient. Driven by the need to find a more suitable alternative, IBN Group Leader Dr Yugen Zhang and his team synthesized a chemical compound made up of molecules linked together in a chain. 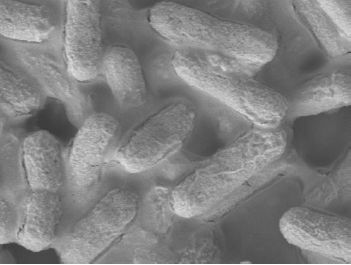 Called imidazolium oligomers, this material can kill 99.7% of the E. coli bacteria within 30 seconds aided by its chain-like structure, which helps to penetrate the cell membrane and destroy the bacteria. In contrast, antibiotics only kill the bacteria without destroying the cell membrane. Leaving the cell structure intact allows new antibiotic-resistant bacteria to grow. "Our unique material can kill bacteria rapidly and inhibit the development of antibiotic-resistant bacteria. Computational chemistry studies supported our experimental findings that the chain-like compound works by attacking the cell membrane. 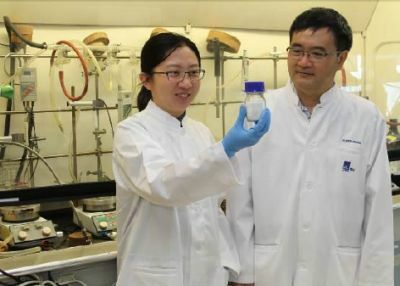 This material is also safe for use because it carries a positive charge that targets the more negatively charged bacteria, without destroying red blood cells," said Dr Zhang. The imidazolium oligomers come in the form of a white powder that is soluble in water. The researchers also found that once this was dissolved in alcohol, it formed gels spontaneously. This material could be incorporated in alcoholic sprays that are used for sterilization in hospitals or homes. E. coli is a type of bacteria found in the intestines of humans and animals, and some strains can cause severe diarrhea, abdominal pain and fever. Such infection is contagious and can spread through contaminated food or water, or from contact with people or animals. Good hygiene practices and proper food handling can prevent E. coli infections. Besides E. coli, IBN's material was also tested against other common strains of antibiotic-resistant bacteria and fungi, such as Staphylococcus aureus, Pseudomonas aeruginosa and Candida albicans. These pathogens can cause conditions ranging from skin infections to pneumonia and toxic shock syndrome. Our material was able to kill 99.9% of these microbes within two minutes. 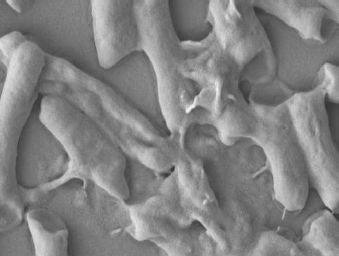 IBN's ultrafast bacteria-killing material could therefore be a potent new weapon against drug-resistant microbes. Scientific Committee on Consumer Safety of the European Commission: "Opinion on Triclosan Antimicrobial Resistance: 5.1 Triclosan in cosmetics". U.S. Food and Drug Administration website: "Triclosan: What Consumers Should Know". 1. S. N. Riduan, Y. Yuan, F. Zhou, J. Leong, H. Su and Y. Zhang, "Ultrafast Killing and Self-Gelling Antimicrobial Imidazolium Oligomers," Small, 12 (2016) 1928. The Institute of Bioengineering and Nanotechnology (IBN) is the world's first bioengineering and nanotechnology research institute. Established in 2003, IBN's mission is to conduct multidisciplinary research across science, engineering, and medicine for breakthroughs to improve healthcare and quality of life. IBN's research activities are focused on Nanomedicine, Synthetic Biosystems, Biodevices and Diagnostics, and Green Chemistry and Energy. The Institute has published over 1,100 papers in leading scientific journals, filed over 550 active patents and patent applications on its inventions, and established 10 spin-off companies. To nurture young research talents, IBN runs a Youth Research Program that offers students research attachment opportunities and exposure to biomedical research. For more information about IBN, please visit www.ibn.a-star.edu.sg.